Skyestone in Broomfield, Colorado is the newest 55+ community in the Denver area. This unique active adult community offers a fresh concept for active living in Colorado that brings the great outdoors inside with their thoughtfully designed homes. Taylor Morrison listened to Colorado's residents and designed a 55 and better community around their needs and desires. Residents of Skyestone will enjoy living in a resort-style community complete with private amenities. With plans to provide outdoor amenities as well, it embraces its surrounding that has a beautiful backdrop of The Flatirons. The clubhouse, The Lodge, serves as the community's main recreation center where you can grab a cup of coffee from the kitchen, meet friends at the fireside lounge, play billiards, or complete a workout. The Lodge offers six distinct spaces: Savor, Taste, Indulge, Play, Rejuvenate, and Refresh. Some of the amenities include a state-of-the-art fitness center, catering kitchen, outdoor pool and spa, and event lawn. Skyestone also has a community garden and miles of trails for walking, biking, and hiking. Taylor Morrison opened Skyestone in early 2014 and the community plans to have 532 single-family homes. There are two collections of home designs that combine low-maintenance living with modern Colorado style. The Landmark Collection features four models that offer 1,584 to 2,247 square feet. These homes have at least two bedrooms, two bathrooms, and an attached two-car garage. Every home includes an optional partial or full-finished basement that allows for extra living spaces, bedrooms, and bathrooms. The Pinnacle Collection features the largest homes in Skyestone. Each of the four models offer at least two bedrooms, two-and-a-half bathrooms, and a three-car garage. These homes range from 2,291 to 2,858 square feet and buyers can add additional bedrooms, bathrooms, or entertainment spaces with an optional partial or full-finished basement. The Lodge is the social hub of the community. Skyestone residents are able to grab a bite to eat, watch sporting events with friends, play games, attend cooking or yoga classes, and unwind poolside. Skyestone offers the perfect setting that fosters an environment where residents can relax, rejuvenate, and make lasting friendships. Skyestone is located in Broomfield, Colorado. 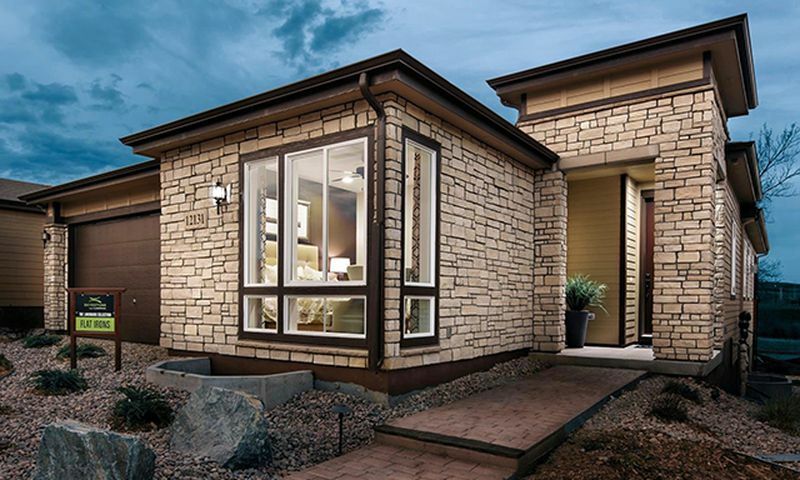 There are countless attractions and everyday conveniences located throughout Broomfield. Some nearby attractions include golf courses, Flatiron Crossing Mall and Broomfield Veterans Memorial Museum. Colorado is an outdoor adventurer's paradise with bountiful recreational opportunities that include miles of hiking, state parks, and more. U.S. Route 36 (Boulder-Denver Turnpike) is ideally located just a few miles east of Skyestone. This active adult community enjoys a convenient location that is 20 minutes south of Boulder and 30 minutes north of Denver. With so much to do inside and outside of the community; it's clear that Skyestone is a wonderful community for active adults. The Lodge serves as Skyestone's main recreation center. Check back soon for more information on the lifestyle in Skyestone. Skyestone's Landmark Collection offers four floor plans that range from 1,584 to 2,247 square feet in size. These residences offer at least two bedrooms, two bathrooms, and an attached two-car garage. Buyers can add additional living spaces with an optional partial or full-finished basement. The Pinnacle Collection features the largest homes in Skyestone. Each of the four models offer at least two bedrooms, two-and-a-half bathrooms, and a three-car garage. These homes range from 2,291 to 2,858 square feet and buyers can add additional living spaces with an optional partial or full-finished basement. We live in the area and have been eagerly waiting for Skyestone to be a little further along before deciding on a home to build. Probably next year! The community looks like it is going to be amazing. We've been through the models and drive through about once a month to see what's happening. The quality looks really impressive and we are very excited for the opportunity to live at Skyestone! Can't wait! 55places.com is not affiliated with the developer(s) or homeowners association of Skyestone. The information you submit is distributed to a 55places.com Partner Agent, who is a licensed real estate agent. The information regarding Skyestone has not been verified or approved by the developer or homeowners association. Please verify all information prior to purchasing. 55places.com is not responsible for any errors regarding the information displayed on this website.